Plethora of new features await you in this expansion. 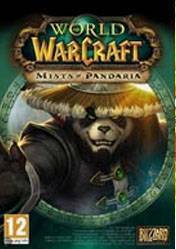 Discover the Kingdom of Pandaria and take control of the new Pandaren race up to the new level cap of 90. A new classe finally : you will now have the opportunity to play the Monk. A true master of martial arts, it can inflict damage, tank and heal depending on the chosen talents. A complete overhaul of the talent system, play your class as you want and choose the spells you want. The challenge mode will allow you to try to finish a dungeon as soon as possible to get a medal based on your speed (like in Gran Turismo, or also in Aion). These awards will allow you to buy mounts, new armor skins, pets and more. A ranking will also be available about who is the fastest. The fighting pet system will also be a new feature to satisfy all fans of Pokemon! Get ready for all the new Zones : The Wandering Isle, The Jade Forest, Valley of the Four Winds, Krasarang Wilds, Kun-Lai Summit, Dread Wastes, Townlong Steppes and Vale of Eternal Blossoms New achievements, new mounts, new instances and not to mention loads of new items, get impressed once again by the amazing work of Blizzard. There are no comments yet about World of Warcraft: Mists of Pandaria . You can be the first one!